Student data are analysed to identify students at risk of failing. Early analysis of student data and interventions can improve student retention in the HE institution. Four predictive models are constructed from different kind of student demographic and activity-related data. The final prediction is calculated from the results of the four models. The activity related data are collected and the predictions are updated daily. Predictions with justifications are made available to tutors and course teams using the dashboard with the views for the whole course, tutor’s study group and individual students. Based on the predictions the tutors can intervene. Since 2014 the system has been piloted on more than 70,000 students. Zdenek Zdrahal is a Professor of Knowledge Engineering at Knowledge Media Institute of the Open University. His research interests include learning analytics, knowledge modelling and management, reasoning, machine learning, and Web technology. 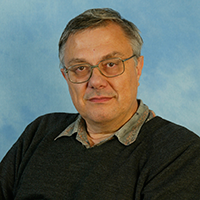 At the Open University he leads the OU Analyse project aiming at the implementation of methods for predicting student performance and developing personalised study recommenders.